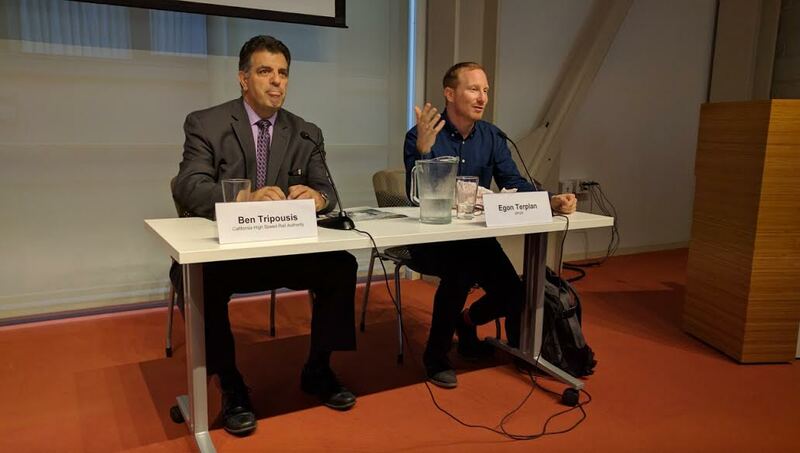 High-Speed Rail construction is well underway in the Central Valley, said Ben Tripousis, Northern California Regional Director for the California High Speed Rail Authority, during a forum at the San Francisco Bay Area Planning and Urban Research Association’s (SPUR) Mission Street center. “The High-Speed Rail question has shifted from ‘if’ to ‘when,'” he told the packed house at today’s lunchtime presentation. 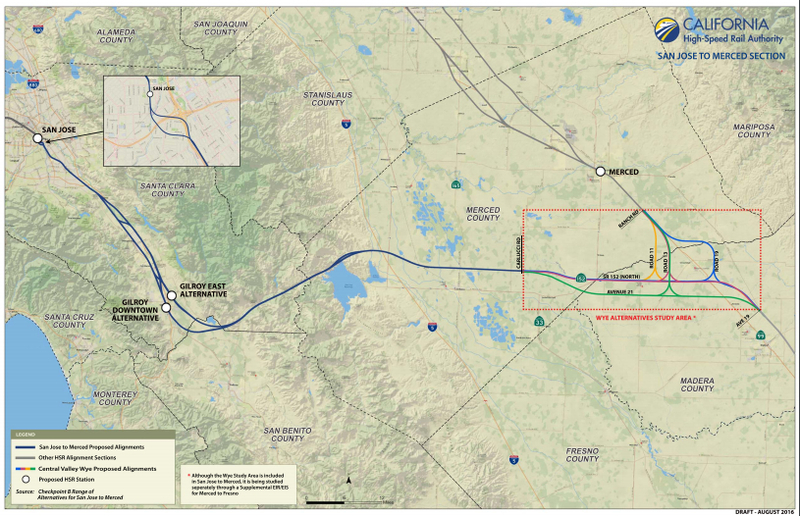 Streetsblog readers will recall that under the new HSR business plan, released earlier this year, the Authority is now doing environmental work and preparing for construction to link the Central Valley to San Francisco via Gilroy and the Caltrain corridor. Bridging the gap from Bakersfield to Los Angeles and Anaheim will come in a later phase. This decision was made after the Authority determined that an initial operating segment could get running faster, and serve more people, by focusing on the northern end of the alignment first. That means “fully electrifying the Caltrain commuter service.” Electrifying Caltrain will permit HSR to share tracks to downtown San Francisco. He explained how Caltrain will eventually run at 110 mph, thanks to HSR-funded upgrades. As to timeline, Tripousis said the preliminary preferred alternative for the alignment for Northern California should be finished this Fall. That means construction of the northern section will begin “near the end of 2017.” In the meantime, he said the Authority is working with local economic groups, transit agencies, and cities along the corridor to facilitate development around the stations. For example, San Jose Diridon Station will eventually have BART service, VTA light rail, Caltrain, HSR and buses, so he wants to make sure they can maximize height and density around the station. Meanwhile, the train’s ultimate Bay Area destination, the Transbay Transit Center, was in the news today. The County Transportation Authority decided to hold up the next round of funding to the tune of “$6.8 million, citing concerns about the sinking [Millennium] tower and cost overruns,” as reported by the San Francisco Examiner. But Tripousis said that Transbay is only one component of the HSR project. “Eventually we will go to the Transbay Transit Center, but in the interim we’ll have a stop at 4th and King,” he said. Additionally, he stressed that the project is as much about an overall statewide rail modernization project. He showed a slide listing the projects contributions to local transit agencies in Northern and Southern California, including $61 mllion for the extension of the Central Subway and $713 million for the electrification of Caltrain service. There were also contributions to Southern California transit projects. But, by his accounting, the project has travel consequences even beyond California. “My long-term goal is to make it so you can book a trip from Fresno to Frankfurt,” he said. This would emulate European systems that permit riders to book through-tickets on HSR trains directly to connecting flights. For example, it’s possible to ride a train directly from a small city in France to the Paris airport to connect with an international flight. He hopes to see the same kind of service in California. “You would leave Fresno on an HSR, get to SFO,” and transfer to an international flight as seamlessly as one transfers from “puddle jumpers” to international flights now, but without the extra runway space and air pollution. 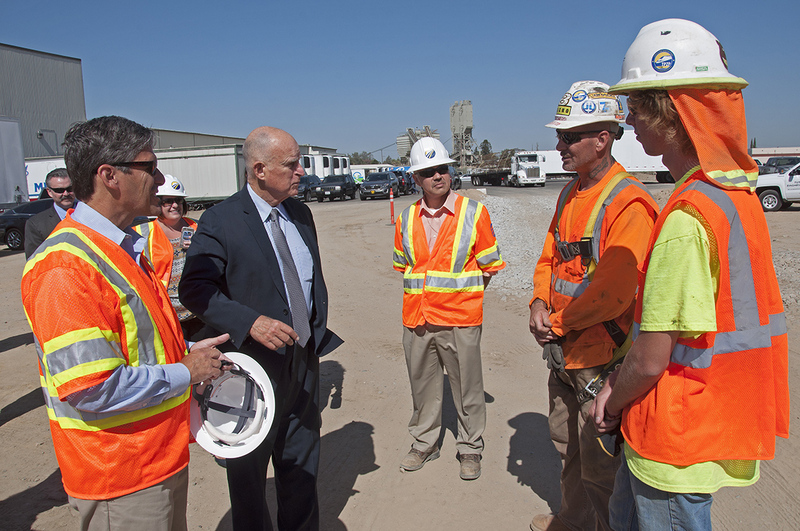 “We are fully under construction in the Central Valley…from Madera to North Bakersfield. You can see the light at end of tunnel and it is, in fact, an oncoming train,” he added, drawing chuckles from the audience. Care to explain how a hyperloop system would be cheaper? It still faces basically the same planning, routing, and design constraints as HSR. Except now we have a vacuum tube instead of a train. He is only one of a long list of right-wing religious fanatics and psychotics, including Pat Robertson and Jimmy Swaggart. unlike this murderous Sociopath ? You’re thinking of closet Klansman Donald, the guy who threatened Hillary’s life. Train speed is a political question, not a technical one. I don’t think in heavily urbanized areas like South Bay you’ll ever top 75mph. Nope. It’s under construction. California isn’t Malaysia, it’s not going to leave a half-finished railway abandoned because of incompetence. We will see about that… it was SF’s own Willie Brown that informed us of the need to mislead the public about costs, proceed to dig a huge fiscal hole and then cry out that it’s too late to back out now. All Californians are aware of this repeated strategy. The fact that construction has started meaning nothing more than money has been spent, in the hopes of getting more money. How is this thing not going to be obsolete by the time it’s done? Japan and China are building Maglev train systems that go at least 100mph faster than the best high speed rail trains can. Does no one know we have airplanes now?? Yes, we do. And HSR will improve the ability of people to connect to the airplanes, much as they do in the rest of the world. If something has worked well wherever it has been tried, maybe we should try it, too. You also fail to see that RT already connects people to airports. HSR will not help with this. You still have to get off the “bullet train” to get on regular RT. First, I might point out that that current local rail transit doesn’t go from downtown Fresno to San Francisco International in a timely and convenient manner. HSR will, and in a more comfortable, affordable and convenient fashion than the local short hop flights. HSR is an intercity technology that can connect those RT systems. Now we have to take whatever the government has to offer, which in most places is only highways, so people have to drive whether they want to or not. They don’t have a choice for most trips. I don’t see private companies building freeways, harbors or airports, either. They’re all government built and subsidized. HSR normally runs at a profit, including in the less than foreign region of the NY-Philly corridor where the Acela not only operates at a profit but also has supplanted the airlines. As for the private market, it’s investing in the Brightline deisel HSR line from Miami to Orlando and the East Texas shinkansen from Dallas to Houston. It’s not about “feel good”, it’s about proven technology that has repeatedly been shown to be effective. Japan and China are also building conventional HSR lines. They probably know something. I think BART should be regauged. The special wheel sets needed are a pointless expense that only prevent through-running and complicates expansion. If it is repeatedly effective, why do I have to pay for it at gun point. And pointing to other systems does not make uncle Jerry’s choo choo cost effective. I might point out that it’s not a “choo choo”. Empty campaign rhetoric aside, there will be no wooden coaches trundling slowly across the prairies behind a tiny steam locomotive as longhorn cattle look on. Second, I seriously doubt that armed men actually invade your home and hold you up at literal gunpoint. I suspect what you’re talking about is taxes being spent in ways you don’t agree with, just as I might not agree with some of the ways you want to spend the tax money that I pay. That’s called government. We get a benefit from living in a stable and orderly society, and we pay the people who do the work of making the system run. We then vote on how the money that was collected should be spent, and in 2008 the people decided, an a fair and open election, that we wanted it spent on HSR. And then again in 2014 when Kashkari made the election a referendum on HSR. As the Trumpites would say; you lost the election (twice), and in a democratic republic you don’t always get your own way. But if it makes you feel better, you don’t pay enough in taxes to even pay for the highway construction in your city, so they spend all your taxes on that. None of what you pay goes to the HSR project. As for future performance, it is true that the fact that it has always worked where tried, including in the United States, doesn’t mean that HSR will also work in California. But the fact that it has succeeded everywhere else doesn’t mean that it will fail.In fact it can be considered evidence for optimism. And the fact that two private companies in the US are building fast trains in the US indicates that there is a market for that service. The BS is getting deep. I couldn’t stand it any longer. I do not have time to research and debunk your theories, but I had to do it anyways. Don’t take me wrong, you do sound very intelligent and well studied. However, there are indeed private airports in USA, as well as many more private harbors. And the trend globally is to move toward privatization of airports, and could likely be an upcoming trend in USA as well. I have a simple experiment to prove you pay your taxes at gun point… Next year, do not pay your taxes. And refuse to do so outright. You will quickly see who is holding that gun to your head. Or try to sell alcohol tax free… or cigarettes. I believe Eric Garner found out we pay cigarette tax at gun point. And as to your point of other “HSR” being built in the US by “private companies” BS! They are building those rails with the understanding they will receive government bonds, government access to land, etc etc etc. It’s crony capitalism and it’s ruining america. The only reason private companies attempt it, is because they know they can get away with it due to the corruption in american governments at every level. I assume you might live in the greater Fresno area, hence your fascination with taking a bullet train to SFO. but what is so wrong with taking a flight out of FAT? I usually fly straight out of SMF, only once have I been to SFO only because someone else was gifting our honeymoon flight to OGG. You claim in 2008 we overwhelmingly voted for HSR. what was voted on was a 220mph choo choo that would cost 9B. Now we have no sight of when the thing will begin to chooch, and its already run up over 68B with no end in sight of the final cost. And you sit there and pretend I am not paying for it? I have to explain to you that gas taxes have increased how many times since then? And not to mention the corruption of government slushing around funds making them darn near untraceable. Don’t pretend it doesn’t happen either, I do not have time to dig up the evidence for that subject. I also want to remove any suspicion you may have I am a trumpeteer, it is not so. I did vote for Kashkari on the grounds of the HSR. But I did not vote thrump. I’m far to more aware of how economics, freedom, liberty, property rights work to support that dimwit. Perhaps finally, you irked me with the notion I might disagree with how you would want to spend tax money…. I would. In fact I disagree with taxes being collected at all. Government has a very very very small purpose in our lives. and to pretend we need government building transportation so we can be civil and live in a stable social economy (or what ever bs terms you used) is laughable. Humans, Americans, and Californians more specifically will thrive when we have maximum personal responsibility thrust upon us. I agree that Bart’s gauge is pointless today….Supposedly Bart wanted a wide special gauge so that it could have its trains travel on the underside of the Golden Gate Bridge and hoped that the bigger tracks would mean that the trains would hold up when heavy winds blow across the bridge. Still, even though I wish Bart were standard gauge, at this point, it’s way too expensive to get Bart to regauge the entire system, not to mention it’d take decades the way construction would most likely go. Yes, I had already concluded that you were a pretty gung-ho libertarian. You know a lot of lies that have been given to you, which you believe because they match your preconceptions. One is the incredibly slow speed of the train. Yes, they do intend to run at 220 mph in the San Joaquin Valley. I suspect this will be limited to the SF to LA limited express. Most trains will probably run at about 185, which is the international standard these days. It seems to be the best compromise between speed and operating expense with the current technology. Opponents are claiming that the top speed will be 110, which is true in the urban areas. Again, that makes it faster than the Tohoku Shinkansen runs between Tokyo and Omiya.Outside of urban areas, where all other HSR systems also run slower than max, the private company that contracts to run the HSR will naturally go a lot faster than that to maximize profits. As for the others; Florida East Coast Railway already owns the right-of-way for their Brightline service between Miami and Cocoa Beach and Texas Central Railway is only looking for the same privileges that the oil companies use to build pipelines. Both projects are being funded by private companies with private money as a profit making venture, regardless of what tall tales Reason Foundation and Kato Institute tell you. Being funded by oil companies, they are against anything that doesn’t sell large amounts of petroleum. I reiterate; HSR has been successful everywhere it’s been tried, including the Acela sort-of-high-speed-in-a-few-places train. You have not so far given any actual evidence that the CAHSR will be the one and only complete failure in the history of HSR other then repeating campaign slogans from the libertarian political activists. Oh, and by the way, since you’ve researched it, what’s the largest privately financed and constructed commercial airport in the US? And I cannot give evidence that Jerry’s”bullet”train will be a complete failure. However it’s hard to believe government can succeed at anything. I won’t pretend to know the largest private airport and by your definition, I’m assuming none fit the description given the collusion that often occurs on public works projects with private investors as in the case of the Florida train and the Texas train. I can guarantee those are not completely clean of public money and your right, neither is oil, neither is a lot of stuff. Because of Grant money or public moneys are there to grab, you better believe they will be grabbed. Funny you should mention Cato and reason. I never read them anyways, lol. I pretty much got a basic taste of what absolute liberty, absolute freedom and absolute property rights look like from hundreds of deferent sources and I believe the libertarian party best aligns itself with those principals. I’d be all for a private venture the likes of the hyper loop. Except that most people don’t realize how much tax money Elon has grabbed through his solar City and Tesla ventures. He’s just as bad as any of them. And I see your point about critics. A lot of them are critical just to be critical, however it’s hard not to when the article was in la times about cahsra just realized they have to dig a tunnel through the mountains around la la Land and it’s going to bump the budget up billions and billions of dollars. Billions we never approved. You must be an anomaly because even my liberal friends have given up support for the “bullet”train. I’m more of an anomaly than you think. I’m a long term Republican who recognizes the value of government infrastructure to the economy. One of the first acts signed by George Washington was for building a lighthouse. I especially prefer established and proven technology over fantastic vaporware like the Hyperloop. Building it would still require considerable government assistance to assemble the right-of-way. You don’t have to read Reason and Kato to know their claims. Ralph Vartebadian, at the LA Times, quotes them chapter and verse without asking for any verification of their claims. CAHSR already knew there would be tunnels. This is just one more. It’s already accounted for in the budget. 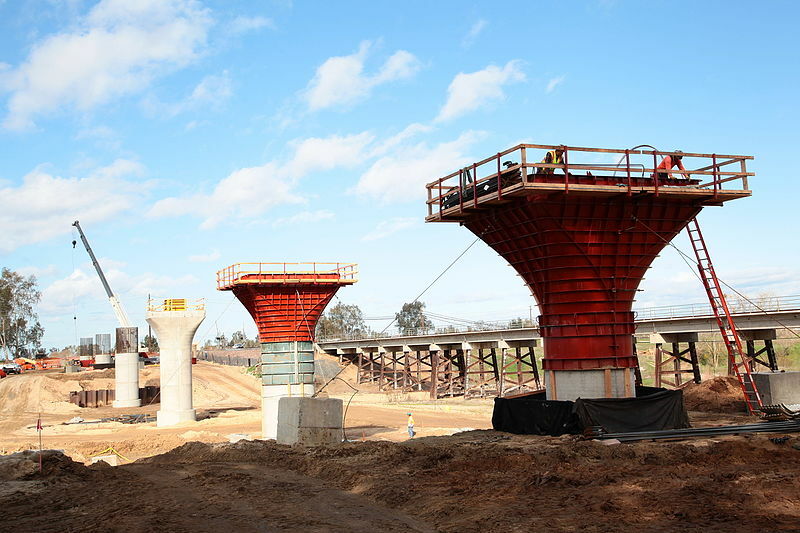 The funds are locked in to build the line from San Jose to just outside Bakersfield. That much is guaranteed to be finished. Funds are being identified to continue the southern end to downtown, and that much is highly likely in the initial operating segment. After that people will see and ride the train. We’ll see how popular it turns out to be, but the historical record is very promising. No more a anomaly than I’m used to. I know a lot of Republicans who love socialism as much as their Democrat friends. It is funny, I always look at la times as pinko comie rag (because I despise la la Land) but even one of my favorite journalists, Matt Welch comes from there. And they have been critical of chsra. Sorry, having an epiphany…. I digress. But as far as the budget, I’m pretty sure from my reading, they have blown the budget and whatever was accounted for has already overrun it. That reminds me of the functional definition of anarchy being any level of totalitarian control less extreme than that advocated by the speaker. What does the bullet train offer? 1: California is growing. As the population grows we need to increase our transportation infrastructure to keep the economy from stultifying and grinding to a crawl. It would cost 50% more to build the equivalent capacity of freeway and airport expansions to serve the I-5 corridor. In addition, highways routinely generate 50 cents on the dollar of investment, and become a long term maintenance expense, while HSR routinely generates a profit that can be used to maintain not only the railway but help subsidize the highways as well. 2: LA to SF is a high traffic corridor. HSR provides the greatest capacity at the lowest use of resources to free up said resources for more productive uses. Energy and materials can be diverted by the market to build and operate more factories at lower costs since there’s less competition with the government for the resources. 3: HSR is faster than driving, more convenient and comfortable than flying and safer per passenger mile than either form of transportation. It also appeals to a demographic that finds neither form of transportation desirable and so increases total travel and economic activity. 4: The San Joaquin Valley is a natural cul-de-sac, with poor transportation in and out. By tying it to the rest of California with a more effective form of transportation, the economy of the valley can be expanded and modernized. Instead of a net consumer of tax dollars they can become a net producer. 5: Rail transit has been repeatedly proven popular in the US, with multiple expansions of the light rail in Dallas and LA. The Expo line, initially estimated to have 27,000 riders a day by 2020, opened in 2012. The 2020 projection was passed by 2013 and the current ridership is over 55,0000 a day. In an area with cheap cars and gas and a historical devotion to the automobile. Faster trains are more convenient, hence more popular. The anit-rail campaign has remained in full swing since the election and support for this specific project is fairly low, but more than half of the people still say they want a high speed train. High speed rail in other countries may technically be safer, not sure about your data point, but I did find another that find trains in the us have on average much higher accident rate than planes. Not sure about the need to serve the valley better, but I’ve driven down 99 and 5 to la la Land and San Diego and have never found the highway to be congested. On the contrary try getting around Sacramento from 2pm-7pm, good luck. And Sacramento has lots of RT trains. But usually while I’m sitting at a real crossing I find the train cars are largely empty. Personally I see much better use of even a part of that money being spent to improve highway flow through Sacramento (obviously because I only care about my self) instead you got Jerry and the good for nothing Cal trans currently repaving a section of hwy 50 that had very little wrong with it! It will be interesting to see how hsr develops, what the end result is. Unfortunately if it is a massive fail, it will be too late to get our hundreds of billions back…..